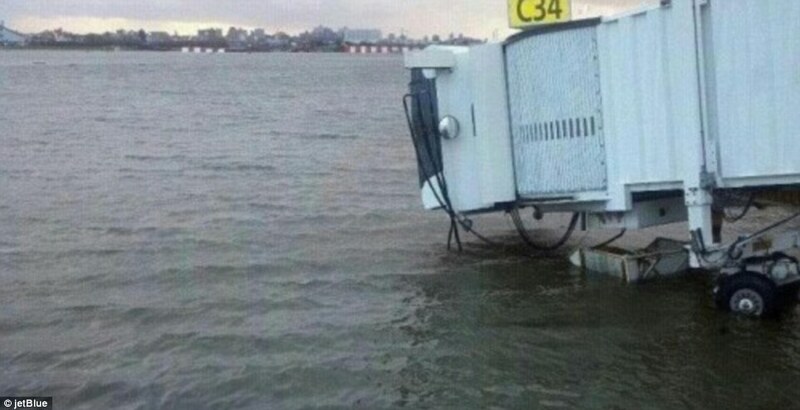 As is to be expected with a storm of this size and severity, Hurricane Sandy has caused significant disruption to shipping throughout the US, impacted by the effects of the storm on ports and airports in the major hubs of the US North East. 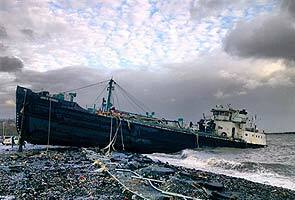 Air, Ocean, Road and Rail networks are all affected. 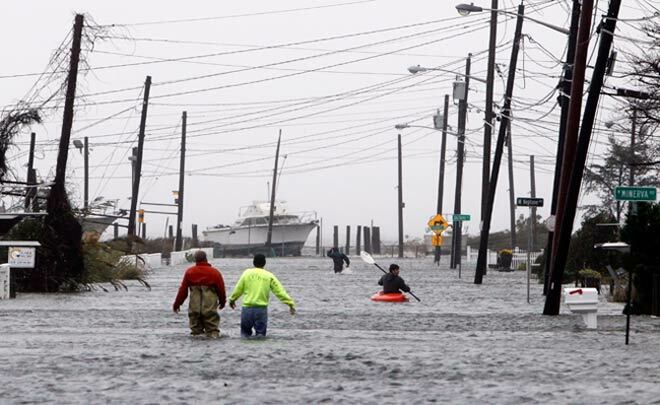 – Many offices and warehouses throughout the affected region (NY, NJ, PA, NC) are without power and either remain closed or are operating under limited functionality. In many cases, operations have been transferred to other US locations where that has been possible. – Landlines are generally working through the region, but cell traffic can be unreliable. Data networks and website operations have been significantly disrupted in the case where ISP’s are based in the affected region. – Major roads throughout the region are working normally, but many local restrictions on side roads. – Rail networks (Freight and Passenger) throughout the US are affected due to damage and delay in the affected region. – Major freight airports at JFK and EWR operational, but a significant delay to uplift of cargo is expected to remain an issue from all US airports as airline networks come back in to complete service. – New York / New Jersey ports – closed until further notice (for statement from Port Authority see below). It is reported that there has been mimimal damage to dry containers which were in port during the storm, and that refrigerated containers continue to operate well under their own gensets. – Norfolk, Charleston, Philadelphia, Baltimore ports – gates are open and terminals are operational, but operations are slow, and vessels remain out of rotation. Delays are expected to continue for at least a number of days. We have not been advised of the diversion of any inbound vessels from their originally scheduled ports, but we expect routings to be adjusted by the shipping lines as they work to bring their networks in to alignment. We will continue to keep our customers updated, and will post additional information as the situation changes, but please do not hesitate to contact us should we be able to assist with any more specific questions. New York / New Jersey ports – all terminals are currently closed until further notice, with no date being advised for the commencement of operations. Port Authority staff is working to clear roads and is communicating with the container terminal operators and major tenants to coordinate the clean up and reinstatement of service. Only select essential personnel are permitted on port at this time. All non-essential personnel will be denied access by PAPD at port entrances. INDEX International Design Exhibition and The Office Exhibition will come together in 2013 to create an ‘Interiors Super Show’ for the Middle East & North Africa’s Architect and Design community. The decision to bring these two established brands together was taken after several months of extensive research into the changing landscape of the global interiors market, and to further support the continuing evolution of the INDEX International Design Exhibition; an event that is already widely recognised as the region’s largest and most established interiors exhibition. As the total spend on interior design in the GCC is expected to top US$56 billion in 2012, more and more manufacturers and suppliers are expanding and diversifying their range of products and services to target the entire spectrum of interiors fit-out and refurbishment projects. Equally, more and more Architect and Design companies are expanding their consultancy capabilities to cross the boundaries between commercial, residential, hospitality and retail design in order to chase lucrative fit-out projects across the region, which last year were valued at an astounding US$8.6 billion. INDEX Event Director Frederique Maurell commented, “I am delighted that The Office Exhibition will become part of the INDEX International Design Exhibition next year. The Office Exhibition has already cemented its place within the Middle East commercial design industry, but the synergy with INDEX makes perfect strategic sense, and we look forward to driving the show forward. By adding new profiles, developing the show and attaching the show to a larger regional design show, The Office Exhibition can only benefit and grow organically to become the region’s premier commercial design event”. Maintaining its own brand identity, The Office Exhibition will however become an integral part of INDEX, and will remain fully focused on showcasing the most innovative and creative working environments for offices, sports venues, and education and healthcare facilities, as well as a range of other commercial environments. INDEX will continue to focus on supporting the region’s demand for the latest residential, hospitality and retail-related interior products and services across its existing 9 show sectors (Furnishings, Furniture, Couture, Kitchen & Bathroom, Lighting, Outdoor Living, Textiles, Inspire and Surfaces & Finishes); whilst InRetail will move over to The Office Exhibition. With an eleven-year history and an attendance of more than 4,200 architects, interior designers, specifiers and procurement managers at the 2012 event, The Office Exhibition will create an additional 9,800sqm of space at INDEX 2013. With 54% of the INDEX International Design Exhibition’s 27,000 visitors being involved in commercial interiors projects, The Office Exhibition will see its visitor numbers increase dramatically next year. The INDEX International Design Exhibition 2013, incorporating The Office Exhibition, will take place from 20th-23rd May 2013 at the Dubai World Trade Centre and will feature more than 1,300 exhibitors spread across 45,000sqm, representing top international brands from more than 50 countries. Chairing the Debate – Updated ! Update : Note that the same furniture was used for the Presidential Debate on Monday 22nd October ! As the dust settled on the second debate of this election season Thursday, when Vice President Joe Biden and Congressman Paul Ryan faced off, there was one clear winner: furniture. “Opinions on who won Thursday night’s vice presidential debate may well line up — not the first time!!! — along ideological lines,” he wrote. “Right-wingers will dwell on Vice President Biden’s demonstrable and annoying personal tics — his laugh, the dismissive smiles that share a border with Al Gore’s smirks of 2000 — and Paul Ryan’s reasoned responses and respectable demeanor. Left-wingers will dwell on the sitting veep’s clear command of policy issues, from A to Z. Which means that the term “tie” will get tossed around quite a bit in the coming news cycles. Wemple wrote about the “chasm” between the presidential debaters and Jim Lehrer when they went at it last week. “We’re calling this one a blowout for the furniture,” he wrote. So who made the tables used for the vice presidential debate? It was hard to tell from the video and photos from the event held at Centre College in Danville, Ken. (If you know who made the tables, please let us know). But the chairs were easily recognizable. 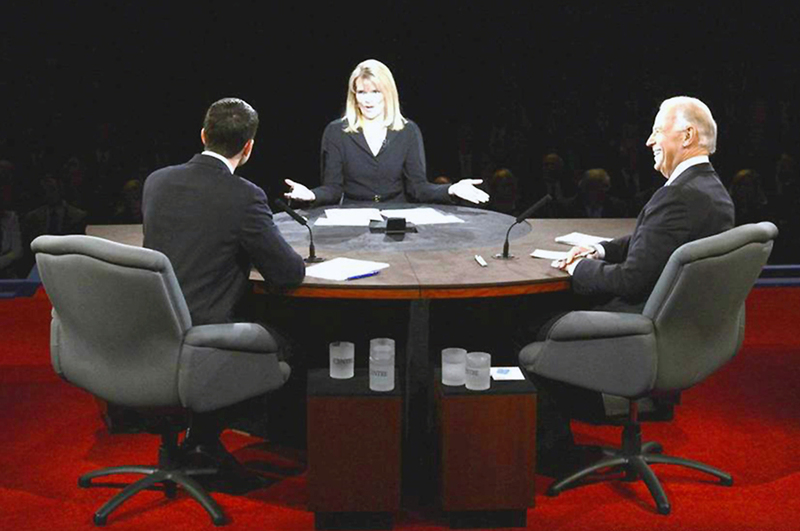 Raddatz sat in a Steelcase Leap chair with mahogany leather, though chances are she didn’t know the name of her chair or the technology that kept her comfortable as she made the vice presidential candidates squirm in their chairs (we will get to those in a minute). Any Steelcase dealer or chair geek could tell her that four years of research work by 27 scientists and 732 test participants helped create the LiveBack technology that makes Leap adjust to the spine of the user. Though it is hard to tell if it is the real deal or a knockoff, it appears as if Jim Lehrer, who moderated the first presidential debate, was sitting in a Herman Miller Eames Aluminum Group Management Chair. Sadly, the vice presidential candidates probably didn’t know who made the chairs they were sitting in while they grilled each other, rolled their eyes and smirked as the other attempted to answer questions about Social Security and Iran’s nuclear threat. The vice presidential debate chairs are veterans in the political arena. The HBF Arlington Chairs have been used in the presidential and vice presidential debates since 2000. According to HBF Brand Manager Sarah Nielsen the chairs date back to the George W. Bush/Al Gore presidential debate in Winston-Salem, N.C. HBF was picked to supply the chairs because one of the facility managers for the debate commission was a fan of the company’s furniture. The commission contacted a salesperson and HBF and the company sold the group the chairs. Seated debates are a somewhat new phenomenon in politics. The Bush/Gore debate at Wake Forest University was the first ever seated debate. Before such time, height was considered an important factor since it was believed that taller candidates fared better in debates. The debate coordinators were concerned about height while seated as well and asked HBF to produce the chairs without the height adjustability mechanism. Maybe the first question at the next debate should not be about foreign policy, the economy or healthcare. Let’s petition the moderator to ask the candidates a much simpler question: How does that chair feel? Comments Off on Chairing the Debate – Updated !